We are a small group of amateur astronomers who have just got funding and are in the process of building a community observatory on St Martin’s. This will enable our community and our visitors to fully appreciate the wonders of our amazing unpolluted dark skies. To help raise funds we are holding a Gala Dinner on the 6th October 2018 at the Karma Hotel on St Martin’s. The guest speaker is acclaimed astrophotographer Damian Peach. We invite you and your Society members to join the Loughton Astronomical Society on the 10th November 2018 to celebrate our 50th Anniversary. Originally formed from an evening class to teach mirror making, the LAS continues to thrive with an active weekly programme and also organises the Autumn Equinox Skycamp at Kelling Heath. 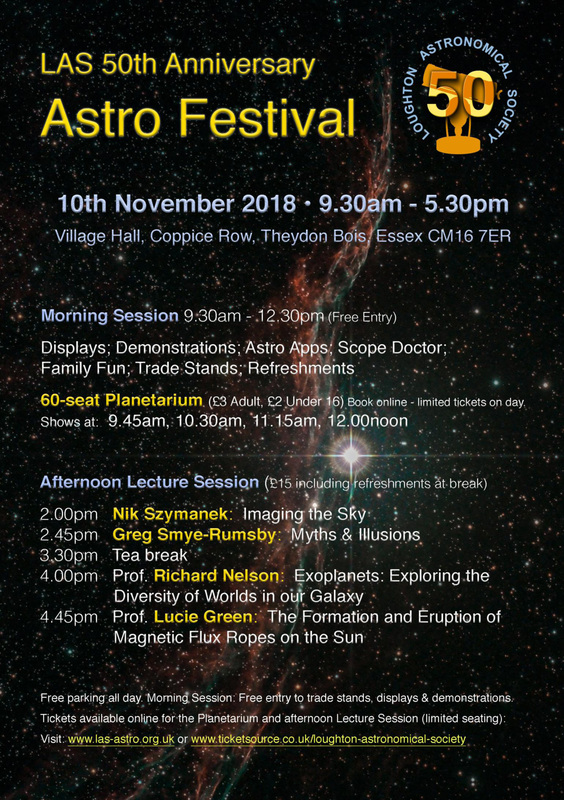 Our 50th celebrations will start with displays, demonstrations and an indoor planetarium in the morning, followed by lectures from top astronomers in the afternoon. Please see the attached advertisement or visit www.las-astro.org.uk for details and the opportunity to purchase tickets. Details for our upcoming convention and AGM can now be found here, check regularly for updates. Tickets can be booked online here. New Member Society – Welcome to BASEG! We would like to welcome Basingstoke Astronomy Society Expedition Group (BASEG) to the FAS! Be sure to order your astrocalendars now for collection at the Convention/AGM. Tickets are now available for the FAS Convention 2017. Which will take place at the University of Birmingham on September 30th, 2017. We would like to welcome The Athenaeum Astronomy Association to the FAS. They meet in Nowton Park in Bury St Edmunds. We wish them the best of luck and clear skies.